Are you looking for cheaply children skater shoes? 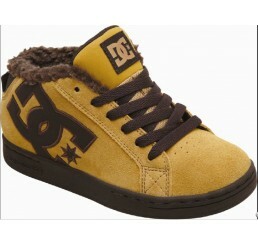 Here in our skater-schuhe.de online shop you can find a wide range of kids shoes. We´ve got the latest brands like Circa, DC, Emerica and és and this to unbelivable cheaply prices. Now order kids shoes easily and comfortable online. In infancy, it´s very important that the shoes are comfortable and have a stable hold. Nowadays, the appearance of the shoes are certainly more important. The shoes from our kids have to be comfortable and stylisch, of course. Here you have just the right choice with skater shoes for kids. These are mostly extra padded because they are designet to skate and so they have to absorb the shock while jumps and stunts. Today skater shoes were designet with the trend and so they are always up to date and stylisch! As the same as adult skater shoes is the difference between low-cut and high-cut. This refers to the shank height of the shoes because low is under the ankle and high above. 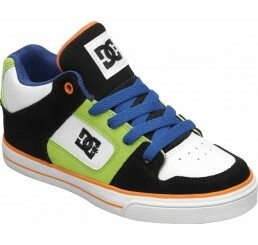 Gives the skater shoes for kids today from every brand and in every possible color variations. Times they are colorful and even more simple. Even with low and one with high shaft. Thus for every taste the right here. Our selection of children's footwear ranges from the brands Emerica, DC and etnies to traps and Globe. Today, the appearance of the shoe for the little ones is usually more important than the comfort and support. Skate shoes with high shafts for example offer both. Through the high-cut blade design of the shoe, especially in the ankle area offers a lot of stability. Optical All models are in vogue as they are designed to Special Modes. Skate shoes for kids? Now you can easily buy children's shoes online and this too insanely low prices. We offer brand products with high quality at reduced prices.